It’s about to begin: the parties and pageants, and the decorating and gift-giving. But the pressure to meet expectations—our own or another’s—can drain joy out of what some call “the most wonderful time of the year.” Parents of young children may feel this the most strongly. Is there a way to get ready for the holidays that can relieve stress, even as we set the stage to celebrate Thanksgiving and Christmas? “How do I choose to make things beautiful and make things tasty this holiday season in a way that reduces my stress rather than adds to it?” asks author and actress Wendy Speake, my guest for this Inside Out podcast. Speake is the co-author of the new book Life Creative: Inspiration for Today’s Renaissance Mom. The key is in the way we choose to get things done, she says. We can find refreshment and energy in the process of preparing for the holidays if we can approach the tasks in creative ways we already know bring us joy. Learn more about being creative and reducing stress by listening to my full conversation with Wendy Speake. Do this by clicking on the LISTEN or DOWNLOAD icon above. 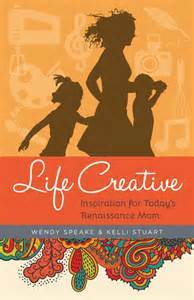 Join Wendy Speake and her co-author Kelli Stuart on the Life Creative website to learn more about the book Life Creative: Inspiration for Today’s Renaissance Mom.